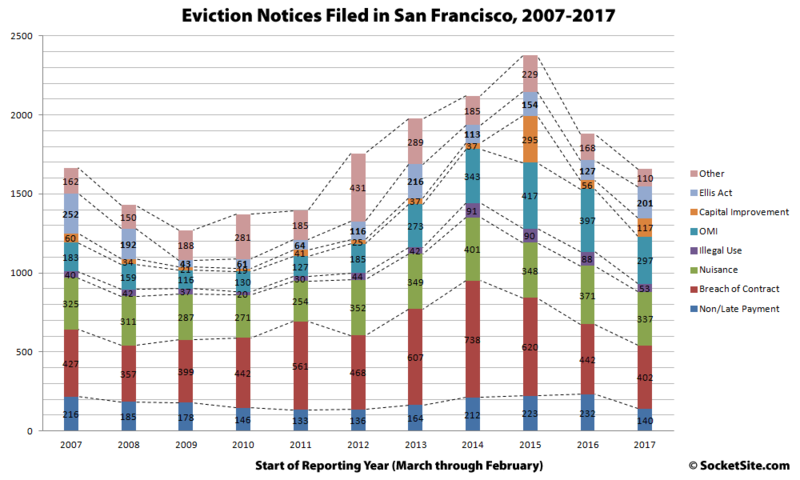 The number of eviction notices filed with San Francisco’s Rent Board dropped 12 percent over the past year, from 1,881 to 1,657. But there was one category in which there was a notable increase in notices: those related to Ellis Act evictions, the number of which (201) jumped 58 percent to a four-year high and is running 49 percent above its 10-year average. At the same time, the number of eviction notices related to a failure to pay rent, either in the absolute or in a timely fashion, dropped 40 percent to 140, which is 21 percent below its 10-year average, while the number of notices related to Owner Move-In (OMI) evictions dropped 25 percent to 297 but is running 38 percent above average. We’ll also note that roughly half (44 percent) of all eviction notices filed over the past year were related to either a technical breach of a tenant’s lease (402), not including those related to the aforementioned payment of rents, or a claimed “nuisance” (337) which is defined as “creating a substantial interference with the comfort, safety, or enjoyment of the landlord or other tenants in the building” and has included such acts as hanging one’s laundry outside one’s window or in a common area. I think the 100%+ increase in Capital Improvement evictions would qualify as a ‘notable increase’. Perhaps the bump in capital improvement evictions is related to the deadline for mandatory seismic retrofit of soft-story buildings. Temporary displacement today to avoid permanent displacement (or death) in the future. 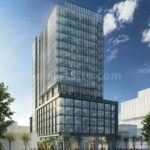 Considering that Capital Improvement evictions are technically temporary (with the right to return and relocation payments), 31 percent of the CI notices last year were for units in the same building and there’s a push to seismically upgrade deficient buildings, we’d (obviously) disagree. I wonder in what category a pre-fire eviction at the Ghost Ship building in Oakland would have (should have) fallen – presumably it could have been in several of those listed here. There are plenty of ‘breach of contract’ or ‘nuisance’ situations that can arise in which tenants keep paying the rent but nonetheless represent a hazard. I have a tenant (in a municipality outside of San Francisco) who is a very nice guy, late middle aged Japanese American man, keeps to himself, pays his rent on time all the time. I have come to realize he is also a compulsive hoarder. His kitchen looks like a science experiment. He managed to kill the refrigerator in the unit and didn’t tell anyone for 5 months, so that turned into a petri dish. He was afraid of having to clean up. His upstairs neighbor complains about smells floating up from below. The guy is a hazard to himself and by attracting pests and mold, a hazard to his neighbors. I have no non-payment related reason to ask him to leave, but I may have to if he can’t get his life together. The San Francisco journalistic shorthand of, “Breach of Contract Evictions = evil landlord attacks poor tenants for hanging laundry Kowloon-style” is a reliable oversimplification of a business challenge for housing providers. I find it odd that you try to draw the comparison with Ghost Ship. That building should not have had anyone living in it at any time. Whatever transpired between the owner and the master tenant there — and my feelings lean toward greed on both sides — didn’t have anything to do with challenges for housing providers. Because it wasn’t housing, it was a light industrial property. The Ghost Ship was not intended to be a housing provider but I am sure once people were living there, they would have been afforded tenant’s rights. I can imagine a great gnashing of teeth about a loss of artist space and the death of ‘The-Oakland-We-Have-Come-To-Love.’ My point is that not all breach of contract/nuisance evictions are spurious. People (tenants) do stupid things that endanger themselves and others. You still need to file an unlawful detainer to boot them out – regardless of the zoning of the property in question. It would have been better for all involved if the Ghost Ship had been recognized as a de-facto housing provider and shut down. Depending on the municipality, it can be fairly straightforward to evict a tenant for reasons other than non-payment of rent. I did so with a tenant in a Rocklin home I owned who was building a motorcycle in the living room and ruining the room. Oil spills, tools jamming into walls gouging them. And on and on. A 30 day notice was posted and he was evicted like that. In SF the landlord is guilty until proven innocent and evictions are tough but perhaps you own in a more balanced (landlord vs tenant) locality. You should always have a yearly inspection done – that’s how I discovered the motorcycle project – of all your rentals where issues like this can be identified and the tenant given a window to fix them or be evicted. so proving the quote, “lies, damn lies, and statistics”. by my read, the ellis act numbers were down in 2009, 2010, and 2011 when the financial market was down and lending was tight. (I was lucky enough to buy in 2009-10). then they increased but are still below 2007 levels. (and what about pre-2007?). if there’s an increase here it appears to be in OMIs which also dipped when cash was tight but are much higher vs. 2007-8 than Ellis numbers are. this as people re-entered the market and bought occupied rental stock? also ellis/capital improvement/OMI are all versions of the same story seen from different vantages. really old stock bought by new owners in a city with a really unhealthy cost of entry and among the nations worst renter/owner ratios. this city needs more owners and more housing, more accessory units and more infill. 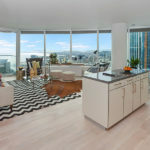 it needs more condo conversions and less onerous TIC rules. it also needs less bureaucratic, more nimble, fairer, and clearer planning/building departments. no-one demolishes here, instead we get in name only remodeling. it might help the affordable housing fund if building permits reflected the actual cost of remodel projects, (were receipt based), instead of based on an honor system of reported cost. Sure, let’s pick a total red herring and imply that it’s par for the course for most nuisance evictions. Playing loud music, bothering neighbors, violating roommate and pet policies, etc. are usually (and rightly so) the reason for nuisance evictions. Just wait for Vacancy Control to hit. The latest Costa Hawkins repeal bill failed though. So … just wait for what? A ballot initiative is circulating and had gathered 100K signatures by mid-February. About 400K are needed to qualify for the ballot and the group pushing it has until mid-June to gather the necessary signatures. It would allow cities and counties to impose rent control on all rental units including homes and condos. It would also impose vacancy control. How does it differ from what was defeated in January? or does it? Essentially the same. The ballot measure does’t ‘require’ anything – it just repeals Costa Hawkins protections for prop owners. Its repeal would allow local jurisdictions to do whatever they want in regulating rental housing. ALL rental housing – apts, condos, SFH, etc. So places like Berkeley and Santa Monica will probably swiftly reinstitute Vacancy Control. Other cities will adopt some form of rent control (maybe apt bldgs only, maybe condos or SFHs too). And others, who have had RC for years will toy with VC and may extend it to even new construction. With major policy groups like SPUR endorsing RC as a way to mitigate the housing ‘crisis’, VC will look like an attractive (initially, anyway) alt to unregulated rental market prices. So if the ballot measure passes in June, it will repeal the Costa Hawkins law. It won’t, however, repeal Murphy’s Law. These stats are on eviction notices served, not actual evictions carried out. I’ve been served with eviction notices three times, two based on OMI and one based on non-payment of rent. All three were frivolous and were eventually rescinded. I have served one OMI eviction notice on tenants, but I rescinded that as well, after they accepted a financial incentive to vacate voluntarily. So the trends are probably valid, but the absolute numbers overstate the actual eviction activity. I wonder which categories have the highest “conversion rates” in terms of notices actually leading to eviction. What is an eviction notice served? Isn’t this just a spreadsheet the editor keeps? What is the data source? San Francisco’s Residential Rent Stabilization and Arbitration Board is required to conduct an annual accounting of all eviction notices filed with the Department. We compiled the past eleven reports above and highlighted a special 20-year report last year. Dave: Repealing Costa Hawkins WOULD eliminate rent control on single family dwellings, but it wouldn’t necessarily impose vacancy control – it would allow cities to impose it if they choose to. There would be individual battles over that. Would Berkeley re-impose it? SF has never had it, but a combination of a Mayor Leno or Kim, and a ‘progressive’ majority on the Board of Supervisors might be tempted to take a stab at it. Might be a bridge too far, politically, though. One other concern – most SF attorneys have been advising landlords to NOT issue 6.14 notices or screen incoming “subsequent occupants”, and to avoid the potential argument of “the landlord ‘approved’ of the subletting, simple do nothing, and rely entirely on Costa Hawkins, which says that when the last original tenant vacates, rent can be raised. If Costa Hawkins is repealed, everyone who took that advice and didn’t use 6.14 notices will no longer have grounds to raise rent when the last original tenant vacates – and a lot of SF attorneys will have serious egg on their face. The initiative, as I wrote, would allow cities and counties to impose rent control on any type of unit (new or old) and vacancy control. It does not mean every locality would do so. The odds are higher in places like SF and Berkeley that they would do so and less likely in say Sacramento. San Francisco is 62% renter and I’d guess the city would apply rent control across the board to multi-units, homes and condos. Vacancy control? I wouldn’t rule it out. If, of course, the initiative passes. Sacramento activists with the SEIU currently have a rent control measure seeking signatures to be on the November ballot FWIW. So there you have it, there will be less rentals and investments into rentals if Costa passes and there are vacancy controls. It will be far less attractive to pay market prices and get rent control returns. Properties will still sell at a premium due to limited supply with most prior rental stock being irrevocably used as owner housing.